HousingPANIC - The Housing Bubble Blog with an Attitude Problem, 2005 - 2008: Warrent Buffett is buying. Are you? Warrent Buffett is buying. Are you? Here's Buffett. Can't say I disagree. Not one bit. I'm buying, although I hope prices go even lower. Stocks are the only things people buy when they're overvalued and sell when they're on firesale. And yes, I'm a massive Buffett fan too. I'm buying ... more puts as the S&P approaches 1100 and the VIX comes down. Everyone in my office thinks I am crazy. Every day the dow/sp drop big...I move cash out of my 2% money market fund into stock funds. Sold above dow 10,000...bying at dow 8500. yeah it may go lower, but this is the only way to secure my retirement. Social Security will not be around in 30 years. Warren Buffett is in a position to get sweetheart deals, like his buying of Goldman Sachs shares before the bailout was announced. Nice work if you can get it. For my own part, since I am not in a position to get tips from Goldman alum Paulson, I like to put money into things I understand. I am planning to buy real estate next year though, but it will be rental property in an area I know. In my opinion, stocks will fall to a low P/E of 7 which means the DOW could hit 4,000. Be careful, I smell a skunk. I think Warrent has a good point here. Stocks will definetely end higher, say, a year or two from now. However, if you don't have the money and the balls Warrent has, I would not mess with this market just yet. It'll still get nasty out there. If you are forced to get out at the wrong time, you will regret it. If you have enough capital to invest for 3 to 4 years out, than I think it's a great move. Old man is clearly senile and a heart bypass surgery waiting to happen with that burger and coke. In one sentence he says that investors should be wary of uncompetitive over leveraged companies then in the next he says to buy with both fists. I for one remain skeptical of both his sanity and his motivation for attempting to pump up markets. Where are the equities profits going to come from? For the next 5 years companies will be reducing over leveraged debt which means lower earnings and lower dividends for common stock holders. The nonsense he is spewing is like saying you should buy a house because in 10 years it will be worth more than it is now even though you will likely be underwater for the next 5. What happens if you need to sell or liquidate 2 years from now? Your fucked... that's what happens. Buffet won't need to sell in 2 years but you likely will to survive the depression. Does everybody really think that if they don't get in now they'll miss out on some big buying opportunities? Does everyone think stocks are prices cheaply? In six months you'll be lucky to see any sort of overall gains. This is just the beginning. The recession has just started, and it's going to be serious. Millions will lose their jobs thanks to the genius homedebtors, greedy and reckless bankers and investors, and a government that told everyone what they wanted to hear. Yep, he's buying. Right until he sells. Then after the market drops, he'll let you know he was selling, leaving you holding a bag of highly devalued stocks. Yes, but not with both feet. Its hard to find any other vehicles to grow money. I also moved 60K into ladder CD not over 18 months. Best rate in 4.25. I know its better having money, but its a pain trying to grow it now ( yes I know stop complaining ) This will be fine over time, unless the USA totally fail. I know I would be scared to death to be 65 years old and thought I would retire soon. Best of luck to everyone, this market is not for the weak. I only want to add that you better be damn picky on your buys the next year. I think top-flight management is more important than ever...one who can manage production /hedging and the credit market. And for God's sake, dollar cost average your equities of choice the next 12 months. Simply because Buffett is wealthy and famous doesn't make him right. Furthermore, how do we know he's actually buying what he says he is? This guy claims that derivatives and hedge funds are weapons of mass destruction, but these are the same things that make HIM wealthy. I'm sorry but you ain't getting an unbiased opinion here. What companies is he referring to? The ones whos earnings are going to dissapear? The ones who pay 1% divident and are trading at 20 times earnings? Some of these foreign stocks are trading at 4 or 5 times earnings paying 10-15% dividends. I really don't know what buffet is looking at. YES, YES buy when there is blood in the water. Warren bought millions of shares of Bank of America in August 2007 at about $50 a share. What an investing genius! He's only lost 50% in one year. I Can't take the lose like he can! Sure Dolt. The old geezer is buying quote "with his own money!" No mention what Berkshire is doing? Yeah, and he's buying for the long-term. Guess he's gonna live to be 500 huh? Gotta give the guy credit for being a patriot; he's pumping America. Will you fall for it? The economy falls apart, and people like Mr. Buffett come in and scoop up what's left - it's the "AMERICAN WAY". The "AMERICAN WAY" is what has lead us to this problem. With all his ill gotten gains, he should be putting some back into infrastructure so people can start working again. Nice to be a multi-BILLIONAIRE that has money to burn. As the dollar tanks...he had better have something to hold its place. Buffet KNOWS what the hell is going to happen. He's a vulture and he's on his way out. Could care less. He got his walking orders to 'play pretend' and be the pied piper to bring in more suckers into the market. "...be greedy when others are fearful." Isn't this how Bushco sold the 'War on Terror' to the 'Coalition of the Willing'. Patriotic Warren also appreciates the use of taxpayer funds to backstop his investments. Jesus Keith, are you really that desperate to get spanked again after your last bottom call? He's just 100% copying what I posted several days ago. Get ready to spend your trash... I mean cash. No indexes. Be 'selective'. VERY 'selective'. Play the business cycle. If you can't eat, drink or smoke it, forget investing in it. You don't have to be an investor. And just because you aren't an investor doesn't mean you're a fool loser. You can be a saver. You can use your own capital without borrowing to build your empire. What's wrong with that????? If a person has the earning power, why must they invest? Isn't it enough to be a solvent consumer and self-sufficient financially? For the third time, Warren Buffett is wrong. He was wrong when he went long on Silver back in '98 and then once again, when he was short on the USD futures for the whole span from '03 to '05, costing him a billion just to maintain those positions for the long haul. The truth is that most of Warren's philosophy was right but for the American century, not today. In '93, when everyone was dumping IBM, I went long. And the reason for it was that most corporate MIS intrastructures were heavily vested in IBM, Big Blue wasn't about to go under. With early 90s piss poor LAN speeds, still new & expensive Unix computing servers, there was no way that two-tiered (client-server) computing was going to subplant the corporate MIS intrastructure for at least another decade or so. Today, given that IBM has hacked most of its established business lines (and is effectively a global subcontracting shop) and have made the remaining mainframes an albatross (to the nth power), that absolute legacy of the legacy systems where no one wants to pay maintenance anymore, I can't be too sure anymore. This company could be gone by 2015-2020 if they don't make some serious headway. And there you have it, Buffett was the great investor of a century where American companies were adding value. Now, there's a chance for the "too big to fail" enterprises like Goldman and Citigrp to be up on govt support for life, via DC-corporate cronyism, but that to me looks like a long term trading channel than a buy & hold strategy. Now, using the Coca-Cola model of investing, Buffett's invention, does Goldman have enough international brand recognition to become a power in rising east Asia? Or, are there preexisting nationalistic forces over there which would keep the leveraged buyouts (and money shuffler types) within east Asian firms run by the Lims, the Tatas, the Nomuras, and the Kims over there? All and all, today's investors have to be more like traders than the old fashion buy & hold because in effect, I see nothing spectacular (meaning omniscient and clairvoyant) about a fellow whose greatest coups were Geico, American Express, and Coca Cola. Heck, if it were possible, I would have bought them for myself just like I did for IBM in '93. The great Jesse Livermore had trumped Buffett by looking at price movements within boxed clusters and made huge fortunes in ridiculous short time frames. It's too bad he was bipolar and had lost his mind when his family life fell apart. So yes, it's better to be psychologically stable, however, I don't believe Buffett's strategy works in today's more convoluted world. I don't buy now. Because I'm not as rich as Warrent. I don't have a cash risk. Buffett has the luxury of buying to hold indefinitely. Even if the investment is negative for years, he can afford to hold onto it for as long as it takes to turn into a positive gain. Most investors saving for their retirements don't have that luxury or investors who depend on gains to cover some or all of their daily living expenses. Neither do the investment portfolio managers whose clients expect postive gains on even a quarter by quarter basis. While I agree with Buffett that their are deals to be had right now, he has alot more ease to invest than most. HE IS BETTING ON THE LONG-TERM!!! People have still not cut back - credit card use way up. AND EVERYONE is calling a bottom...it is the most predicted bottom ever. I think it is very interesting that buffett makes his purchases and then he announces to the world that he is buying..hmmmm?? BTW, How have GE and Goldman Sachs been performing? Becareful of this guy's advice. He gets special deals the normal buyer does not. He buys in bulk too. BS!! Cash is KING. The dividends besides future higher interest rates and savings on sleeping aids and physiatrists are peace of mind. Cool heads always prevail? Time to by into this mess is still a long time away. Warren BS simply wants to sore up a falling house of cards in which some cards are his. Watch out for this Omaha pumpkin who likes to get involved into politics now. Save money now to buy anything in the future when cash will be the last one standing and inflation is burried under lots of deflation. Stay healthy no matter what! He doesn't have a choice... he is forced to match. In America there lives 2 Groups the Fearful and the Greedy. I'm Greedy which is good cause my neighbor next door is fearful. OK, let's play 5 Stocks for 2013. You get $100,000 to invest, you must buy US stocks with it this month, and then you can sell them in 2013 and take the cash. So, what five US stocks would you buy today. And folks, no need to be a hero. The 2nd comment - move a little bit of that cash here and there back into the market. You'll be in pain if you're savings are all in US dollars soon. It is fun to watch the hedge funds blowup and liquidate, isn't it? Want the bottom? It's when the last hedge fund folds. Thousands will be gone in a few months. Thousands. "OK, let's play 5 Stocks for 2013. You get $100,000 to invest, you must buy US stocks with it this month, and then you can sell them in 2013 and take the cash." Can you make this a new thread? Not buying a damn thing; I'm not a fool. Today another classic action from the PPT in the opening, so the market wouldn't go below the 8,700 support level, then came the pumping and dumping crooks and day trader wannabes. Just pay attention how the PPT is trying hard to keep the market above 8,700. Every time it gets close - bam! - it shoots up. That old gizzer, wolf dressed as sheep, is trying to pump his dismal fund, which is down 20% since last week. Not even counting that rotten GE stock he bought, probably to get a date with his bootlicker Becky. Oh yeah, how can we have a clue of real P/Es if the gov keeps nationalizing everything with taxpayer money? Once again, I thought this blog promised not to discuss the stock market after the debacle bottom call when the DOW was at 12,800, or 31% ago. The response will be that the recommendation was only to buy value stocks. Specifically mentioned was Apple at 120 and 37x EPS (some value). Well Apple is now selling at 97, 20% below the screaming buy. 5. Any company that's a bootlicker of snake oil salesman-Obama and his prime minister Pelosi. That includes anything that Al Gore has been making money with, and infrastructure ETFs in the US. Getting short COF and Commercial RE on this bull trap of a rally. Maybe we get another 200 on NAz max.. Anyway pick 4 of them from a hat, plus HTE. "probably to get a date with his bootlicker Becky." Interesting how many posts there are on HP by people lamenting about how the US doesn’t manufacture anything, and how all we do today is consume. Yet on this thread and on others there is so much talk about buying & selling stocks; making money this way. Rarely does somebody write a post about having his own business, and even less frequently does someone talk about starting a business. Does anyone see a pattern here? What built this country was hard work – people inventing and making things. But now, it seems that most HP’ers just want to generate (and preserve) their wealth by moving their money around in the market, rather than by making anything useful. Following what was going on by reading HP, I sold my rental house a year ago this month, paid off my residence, and in January bought the property (2.3 acres) adjacent to mine (with a 20% down payment. The plan is to rent out the 4-stall barn on the property for horses – which should cover the monthly mortgage payment, and to do some market gardening as well. Yes this will never make me rich, but it is satisfying and is one way of putting money to use, vs. just moving it around in the market and hoping a Greater Fool will buy the stock for a higher price than I bought it for. WOW! A LOT of negative sentiment out there! And many personal attacks against the old man. People getting too emotional about money. I'll take that as a contrarian signal to BUY soon. Guess what. The negatives posters here are WRONG. Maybe the equities wont take off for a while. But no one can predict when it will. Get a test portfolio ready. Now. Maybe you dont start pulling the buying trigger today. But SOON you will need to. WHAT'S WRONG WITH BEING READY? Being against Buffett is like being against bunny rabbits or chocolate. The man is a saint. He's made all that money to give it all away. And yes, he makes short term investment mistakes here and there, everyone does since nobody can predict the future, but betting against Buffet is like betting on the Cubs. Buffett for Treasury Secretary. I'd trust him with the nation's money. Unlike Paulson, who I think stole my watch. Here's another idea - screw stock picking and just buy BRK-A or BRK-B. Let Buffett manage your money. Would Buffet have bought March 15th 1933? The largest % gain on the Dow ever? But we are too used to the cyclical growth model to realize something fundamental has changed. I'd gladly buy if I got the same deal as Buffet's getting. But I'm not so I will not. There's an oversupply of everything. I'll wait for the recession to wipe out some players (the low quality ones that can still make it on low cost of capital) before I start my business. Also, currently it's still too early to compete against the imports. Sorry, I'm sitting on my stash until it makes sense to start a business. Give me a break! You're on HP what do you think? People have been negative here for a while now and they've been RIGHT! 1. He's not going to live forever. So why would I buy berkshire? 3. There are deals out there but you must do a lot of research. He has a whole company doing it for him now. 4. He does not need his money short term. Even though much of your comments are right on the mark, I don't find Mr. Buffet's actions at all saintly. If he were a real saint, he'd be telling people what he knows is really going on in the markets - and it doesn't involve pumping stocks. COP - $52 lots of crude & nat gas. $4b coming from Hugo and a nice chunk of Lukoil as long as they keep Vlad happy. EP - $8 a safer nat gas play w/ the pipes providing a cushion of safety for their 2nd rate E&P program. Partially hedged. MLP disbursement fully hedged until ~2013. Beware counterparty hedge risk. C-PRP - $15 $2.03 div $25 paid for each share 2/2018. Uncle Sam just placed $25b on equal footing to this preferred. Don't forget the best investment advice of all - live humbly and save! Buy slowly during the upcoming recession. Rockefeller did the same thing in 1929, it was to instill confidence and then the market tanked for another 3 years. "ROCKEFELLER BUYS, ALLAYING ANXIETY; Elder Financier Says Business Status Does Not Warrant the Destruction of Values. STATEMENT CHEERS STREET Announcement That He and Son Are Accumulating Shares Accelerates the Rally. Statement Allays Alarm. ROCKEFELLER BUYS, ALLAYING ANXIETY Reported Buying Standard Oil. Statement a Surprise." Kieth I want thank you for the end of the bounce contrarian signal. Your predictions over the last few years have been nothing short of awesome. However your stock market calls(short,medium term) have been horrible. I am going to start buying short etfs Monday morning and I will donate 10% profits to the HP tip jar. "The man is a saint. He's made all that money to give it all away." Good for him. The man lives in a $31K home and eats at his local diner. In my town, starter homes go for $310K which make it impossible for an average person to give away his unused savings to the Gates Foundation. "Let Buffett manage your money"
And here I was thinking that HP was about thinking for oneself than in hero worship. I want George Soros to manage my money. Savvy investors NEVER listen to what Warren Buffet says, but always watch what he DOES. When he says that he made a great buy of "XYZ," HE DOESN'T MEAN THAT HE IS BUYING "XYZ" NOW! He has already bought and probably sold it, made his money, and moved on. Many other Buffet watchers have reported this same scenario for years. That's how he has achieved his God-like status. He always tells the truth, after the fact, not during or going into it! Buffet, for those of you who are extremely negative against the man, is an investment god. Period. He is unmatchable. Having said that, I do agree with folks here in that he has a lot more money and a different perspective from the rest of us so it's much easier for him to say "get in the market now". I also think he has a vested interest to get more people to invest, for obvious reasons (brk a and b). finally, there is no doubt that the feds and bankers have asked him to be a cheerleader for the economy and the market. also, he has been wrong before. in 1974 he was telling people to get into the market...a market that basically stayed flat for another 8 years until 1982 if i recall. anyway, i do think it is wise to trade, not invest, selectively right now. get in and out and make the volatility work for you. i hate to say this because it sounds like i'm a housing whore but this is a good opportunity to "flip" some stocks. this market will be going down below 8000 within the next 12 months, for sure. so there will be other oppys to get in. however, if your time frame is really long, getting in now with limited funds (to test the waters) probably is not such a bad idea. We are headed much much lower. When this symmetric triangle breaks (like next week!) we are gonna see the SPX shed another 200 handles faster than you can punch the sell button. And then we're gonna rally, crash, rally, crash until we bottom below 450 and just lay still for a decade or more i.e. no volatility cuz there is no money. Get short and hold it. Interesting . . . my less than stellar review of Buffett was not posted. Wonder why that is? Maybe it is time to hang it up Keith. You seem to genuflect before the altar of St. Warren of Omaha, but there are some of us who are less inclined to celebrity worship. Never thought you would be one of them. I agree with Keith. Buffett is as genuine american as you can get. Just read few pages of his 50 plus year career and how he made his money and how he is donating all away. Only one time other than this article; that was 34 years back ; he made a case of buying equities and you can see the results. Today; there is so much information available through internet; in 1974 it was not possible. So please try to educate yourself by reading few pages and then make a better decision. I guess Buffett is one of the only few people alive from 20th Century; from whom you can learn better than the most. His working ethics and ownership behavior as best as you can get. He warned about this mess as back in 2002. But when music was played no one wanted to listen. This last cycle he has waited long time; till people were calling him crazy for not investing cash. Now it turns out that he was not throwing cash in the toilet earlier. He did the same in 1969-1974 period. So just a request to have more informed opinion then a blind one. Our blog is better informed than the most places on internet. Remember Buffett was early in going bearish during the tech bubble... a few years early. I think he is early in calling this bottom as well. No problem as in a decade he should be doing fine. But in the short term (up to 2-3 years) expect opportunities as things go lower. "i do think it is wise to trade, not invest, selectively right now. get in and out and make the volatility work for you. i hate to say this because it sounds like i'm a housing whore but this is a good opportunity to "flip" some stocks"
No, what it is, is an authentic trading strategy for a secular bear market. Buffett may be an ok fellow, from the whole ethics p.o.v, however, he's a type of permabull meaning that he's only on the lookout for the silver linings, like the Coca-Cola price before they'd fully internationalized their product line in the 80s, etc. In a market like this, end of a credit cycle, permabulls get gored by the bear. True, there are these Reynolds and other tobacco-like firms with < 9 P/E and high dividends to keep themselves honest but a vast majority of American corporations are cash poor and asset rich. Also, just because global markets are getting whacked today doesn't mean that those markets are dead. In fact, there's a good chance that many of the American 'nifty fifty' may be supplanted by them in the years ahead so perhaps it's better to go shopping abroad for those undervalued deals than here. All and all, my point is that there's no reason to worship Buffett but to find your own way. I'm actually quite appalled that the HP founder is touting a follow-the-leader approach than in finding one's own way. That's just as bad as being among the credit hawking sheeple of the 2000s. Keith, you were buying stocks a few months ago before the cliff diving started. How did that work out? looks like the greeter at the local Walmart! try to remember this post in 2013. What is going to fuel the new bull rally, e.g., more consumer debt (who can borrow, who can loan)? He is the King of the Boomers, riding the wave of post WWII prosperity. Buy Berkshire? The man has one foot and four toes in the grave yard. He does not have the time to ride this one out. "With Barack Obama now waiting in the wings to conjure a newer New Deal, far larger than even FDR could have imagined, and at a time when we cannot even afford the old one, this will not be your grandfather's Depression. It may be much worse." We reminded Buffett of the old play on the Kipling lines: "If you can keep your head when all about you are losing theirs … maybe they know something you don't." Keith's point is valid. 2013 is a good time to come and check. Buffett's not called Oracle for a reason. In a single world; if you want to find difference between any other US companies out there vs. Berkshire Hathaway : Rationality . I believe most of our blog members are rational and that's why they were able to avoid this mess. Not getting in to a problem is a skill. But it's under-rated one. if i had 1/2 percent of his accumulated wealth but sense i don't i am a poor woman with 5 kids on welfare i guess i just don't have the finances to buy when others are fearful. Doesn't Ceberus investments or whatever it's called belong to Buffett and in California the department store Mervyns is going out of business because Ceberus leased back buildings at a higher rate driving Mervyns out of business because they couldn't afford the higher rents. Okay I was going to see about getting a job at Mervyns(because all the people with jobs and know people who can get you one say I am lazy and don't wanna work) but that's out. Who is making people fearful, Buffett? I've never seen a bottom occur in the stock market when everyone is talking about it. From Buffet to brokers to main press media to many people here, everywhere I look there is talk of this being "the" bottom. I've been around for a long time, and if this really is "the" bottom then it would be the first time in my life that so many got it right. I don't believe that for a second. I've been out of the market since DJIA 14,000 and I'm still staying out. No doubt we will get some sort of relief rally soon but as in all other rallies it will be yet another fake one and the DJIA will once again head to lower lows. I'll take a look at stocks when we reach the 7200 - 7500 on the DJIA as that is where there is major support. It's just a question of how many bear market rallies will occur until then. Keith - in 2013 we will probably be in the depths of a severe global depression. If you don't wanna short, then just stay in cash. Remember - don't try to catch a falling knife! Warren Buffet wants to leave nothing for his childern. He is 78 years old. Any questions? Historians refer to October 24, 1929 as "Black Thursday." On this day, people began dumping their stocks as quickly as they could. Sell orders inundated market exchanges and the bull market suddenly shifted to a bear market. By that evening, J.P. Morgan and other financiers bought up stock to stop the panic and keep the market afloat. On Friday, October 25, the House of Morgan continued to keep the market stable and it seemed that the panic was over. Yet, many investors began to worry during the weekend. George and Martha and thousands of their friends decided to sell whatever stock they still had as soon as the market opened on Monday. As a result, on Monday, October 28, there was another wave of sell orders. The next day, October 29, 1929, "Black Tuesday," was the beginning of the Great Crash. JP Morgan, then the richest man in the world and famous for his financial skills, did the same thing in 1929, as you can read. ground meat. He ain't perfect. Put a lock, stop breeding! Good lord. Oh yeah, let's see, it takes on average 3.5 years to break even after a normal bear market. This one is huge! You were buying AAPL and other stocks more than two months ago. So you're willing to earn nothing + inflation for more than five years? Sorry, I rather wait for the REAL bottom and come up ahead faster. You know it's not a bottom when all talking heads on CNBC are calling it a bottom. What it appears is that Buffet's investing style has a flavor of small town America and is thereby, often confused for patriotism and the American way. In a way, that's both false and true. The modern American society has produced the big companies like DuPont, IBM, and Pepsico, however, small town America also embraces the small guy to fights the good fight, like Tucker vs the big 3 auto. 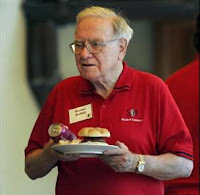 Buffet is simply another person who likes to get in on one of the the S&P100 firms, when they're in a sticky downturn. It's really not too amazing of an investment strategy since his team investigates each of these SP100 firms, day in and day out, to see who's oversold with a healthy management plus balance sheet. Stocks are going down, wiping out 20 years of gains. They are already down to 1997 levels. So a 20 year horizon is not any good. I don't see how to play this long, and make money before I die.